Some of our top performers were whisked off to Oktoberfest this year for another stellar performance all round. 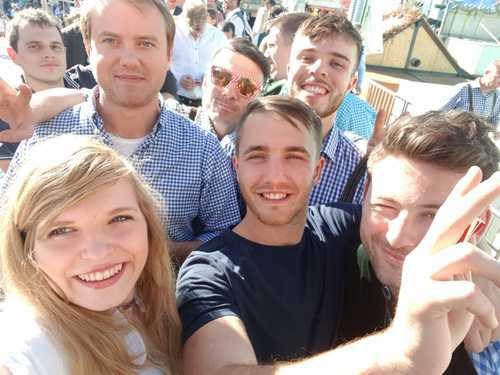 It was traditional Bavarian dress, singing and glass slamming all round as the guys enjoyed the great experience of Germany’s most famous bier festival. One of the many highlights for the team was the rollercoasters and during the battle of rollercoaster bravery, it would appear that most of the screaming came from the men. When questioned, apparently there were too many great beers to pick a favourite. We’ll leave you to decide whether that was a case of too many beers to remember or too many great beers to pick a favourite. What is your favourite German beer? If you’d like to join JCW on the next trip, email hello@jcwresourcing.com or call us on +49 (0) 69 941 89133 to find out more about a prominent career in recruitment with our team in Frankfurt.